But what does this ensemble say about the state of design today? Surely that there is no coherent set of codes or rules to generate an organic whole. You may be right, Anonymous. 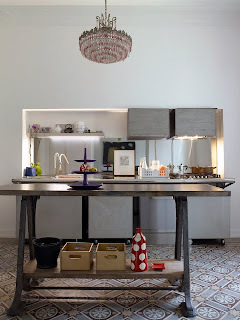 But this is just one photo of one kitchen; can it really be used as a standard for all design? Of course, one could answer yes or no with equal impugnity. We live in fragmented times. I haven't had much time to comment lately, but I do believe this is your most poetic post thus far. A kitchen made entirely of found objects after a storm, those strange discoveries when the snow finally melts. I hate the kitchen, but I love the post. After the preceding unhappy list, could it be a disorganized postmodern unity? Perhaps that should be decontextualized postmodern unity. It should, and now it is.